inhibition within only a marginal therapeutic window. 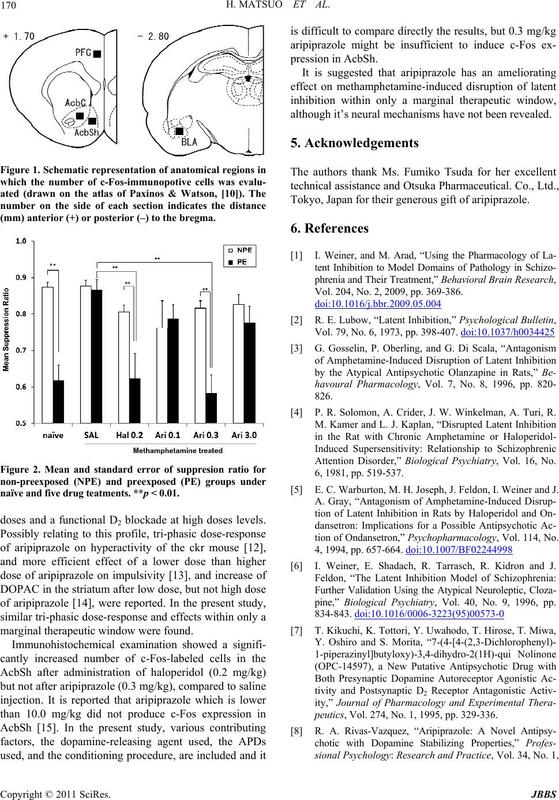 its effect on disrupted LI has not been examined. which the nucleus accumbens would play a key role . in brain areas related to LI. ony room (23˚C ± 1˚C) on a 12:12 h light:dark cycle. animal experimentation at the University of Miyazaki. experimental chamber for 5 min on four consecutive days. continuously presented until the rats completed 1000 licks. was defined as B/ (A + B). Ltd., Tokyo, Japan as a bulk powder. with saline to make 1.0 mg/ml methamphetamine. mine-induced (1.0 mg/kg) disruption of LI was examined. solateral area of the amygdala (BLA) were examined. phetamine (1.0 mg/kg, i.p.) 15 min before conditioning. caudal to the bregma) were selected (Figure 1) . stimulus (tone), were used for statistical analysis. the Ari 0.3 and SAL (p < 0.001 for both) (Table 1). low or high dose of aripiprazole (0.1 or 3.0 mg/kg). mine-releasing agent was sugg ested to be equivalent. cantly higher for Hal 0.2 tha n A ri 0.3 and SAL in Ac bSh ( p < 0.001 for both). (mm) anterior (+) or posterior (–) to the bregma. naïve and five drug teatments. 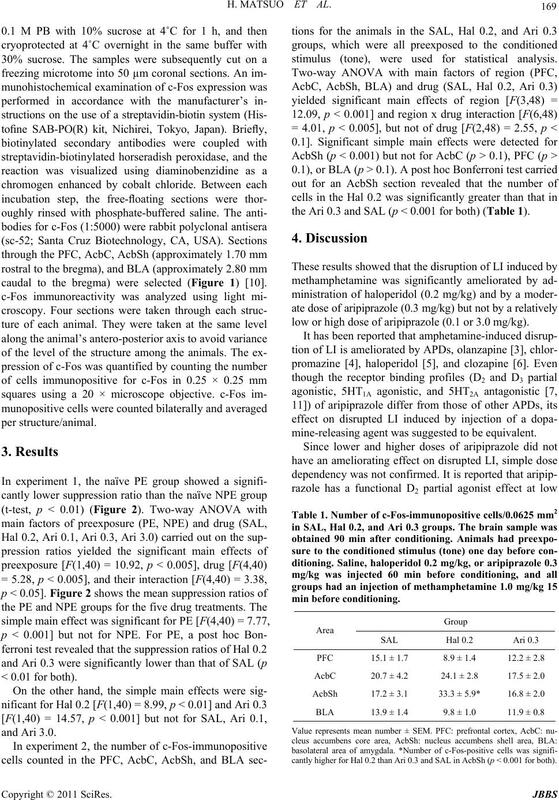 **p < 0.01.
doses and a functional D2 blockade at high doses levels. marginal therapeutic window were found. although it’s neural mechanisms have not been revealed. 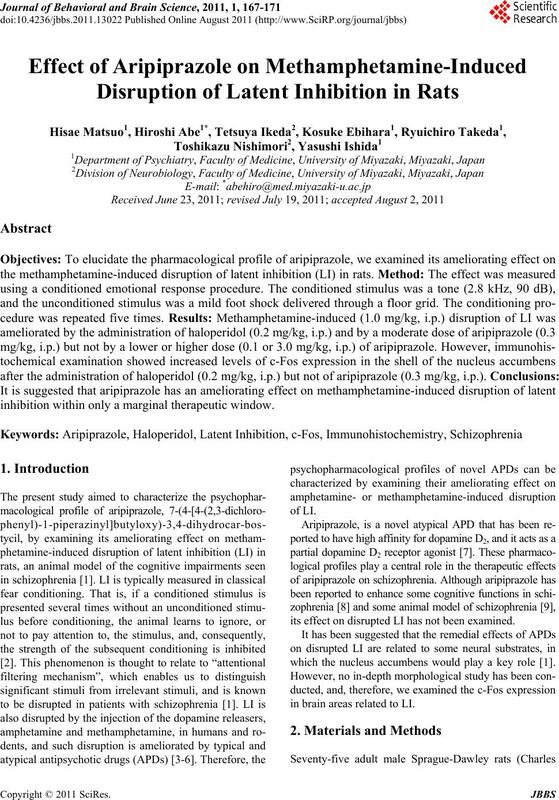 Tokyo, Japan for their generous gift of aripiprazole. Vol. 204, No. 2, 2009, pp. 369-386. P. R. Solomon, A. Crider, J. W. Winkelman, A. Turi, R.
Attention Disorder,” Biological Psychiatry, Vol. 16, No. E. C. Warburton, M. H. Joseph, J. Feldon, I. Weiner and J.
tion of Ondansetron,” Psychopharmacology, Vol. 114, No. 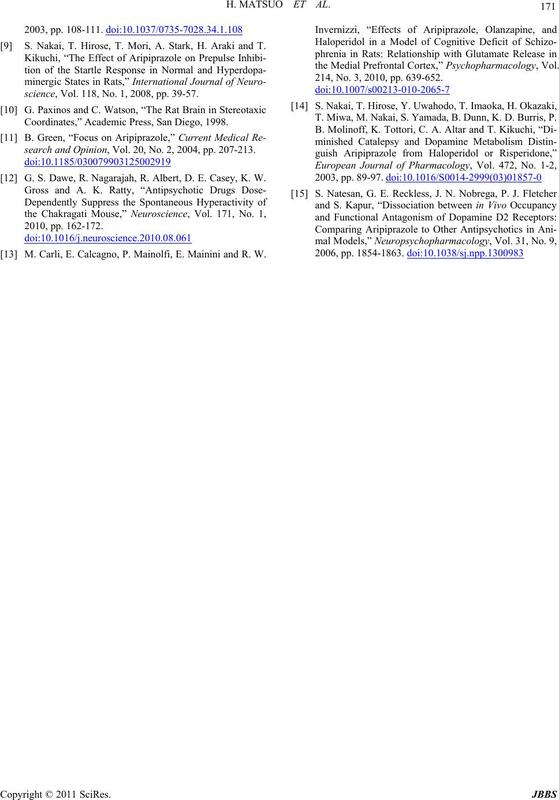 I. Weiner, E. Shadach, R. Tarrasch, R. Kidron and J.
pine,” Biological Psychiatry, Vol. 40, No. 9, 1996, pp. peutics, Vol. 274, No. 1, 1995, pp. 329-336. 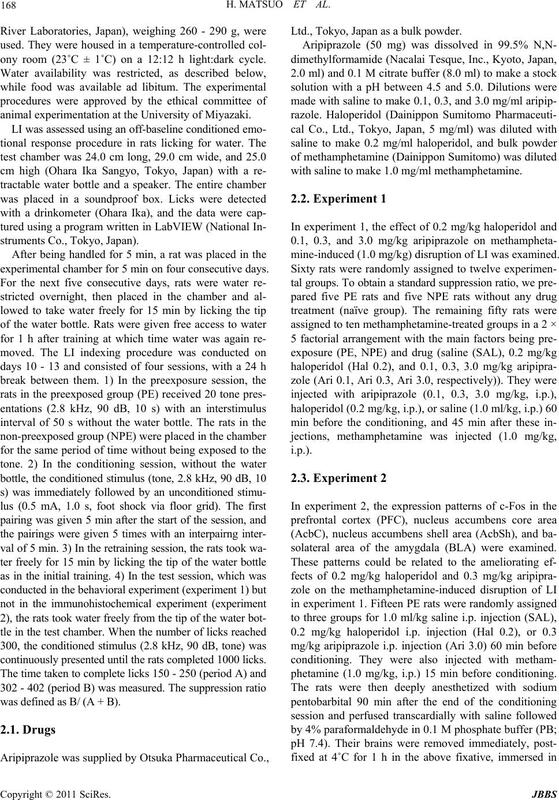 S. Nakai, T. Hirose, T. Mori, A. Stark, H. Araki and T.
science, Vol. 118, No. 1, 2008, pp. 39-57. Coordinates,” Academic Press, San Diego, 1998.
search and Opinion, Vol. 20, No. 2, 2004, pp. 207-213. G. S. Dawe, R. Nagarajah, R. Albert, D. E. Casey, K. W.
 M. Carli, E. Calcagno, P. Mainolfi, E. Mainini and R. W.
the Medial Prefrontal Cortex,” Psychopharmacology, Vol. 214, No. 3, 2010, pp. 639-652. T. Miwa, M. Nakai, S. Yamada, B. Dunn, K. D. Burris, P.